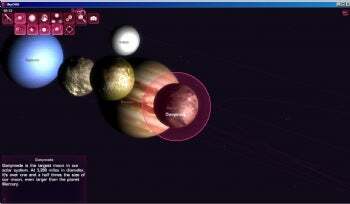 SkyOrb 3D (free) takes you on a tour of the solar system or the galaxy. This free astronomy program charts the stars, planets, and other celestial objects such as comets and asteroids and lets you navigate through space. I had high hopes, but although it paints pretty pictures, its user interface and controls might frustrate laptop astronomers accustomed to the interface of other sky map apps. SkyORB 3D's view of the solar system includes photorealistic representations of planets and moons, but they're not always to scale. The program opens up with a window into which you are asked to enter your physical location (using latitude and longitude) and other graphics settings. The largest resolution SkyOrb 3D is capable of displaying is 1280 by 768, which was a bummer on a computer with a big, 24 inch monitor that supports 1600 by 1200. Once those settings are entered, the program knows with fair accuracy (more on that later) which stars are in the sky above you (or any other location on Earth). Rendered in brilliant detail, the sky is filled with stars,planets, and moonsthat have been, when available, bitmapped with real photographic images of their surface texture. The sun even displays little prominences. In this screenshot, though, you can see how the planet-to-moon size ratio isn't anywhere close to realistic. SkyOrb 3D requires the use of some of DirectX 10's more advanced display capabilities; as a result of DirectX 10 being integrated into Windows Vista and 7 operating system and not regressed, you can't use the current version of SkyOrb under Windows XP. As a longtime user of other astronomy programs (such as Cartes du Ciel, Stellarium, or Starry Night Pro), I found several of the user interface elements and design choices within SkyOrb 3D annoying. The configuration menu that first appears, for instance, does not permit you to enter more than five characters into the latitude or longitude text entry fields, so it wasn't possible to be more precise than the whole degree. For instance, the latitude where I live should be entered as -105.25, and the program counts both the minus sign and decimal point as characters...which means I can't get a map of the stars precisely as I see them. It's a minor point, but one that matters to precision-minded amateur astronomers. I also found that SkyOrb's navigational interface gave me a little trouble at first. A row of icons along the upper left corner of the screen enable or disable the display of various celestial objects, but some are more than just "on/off" toggles and switch between three or more modes. And while the program has a button that lets you take screenshots, I couldn't figure out where the program actually saved the screenshot files, nor was there anything in the configuration window which lets you choose a location to save those files. It took me a while to figure out how to spin the view of the solar system around, but longer to puzzle out how to zoom in and out of a selected target (you have to hold down the mouse wheel button while rolling the wheel--which is about as awkward as it gets). The program's auto-update button simply opened a browser window to the download location where, five minutes earlier, I had downloaded exactly the same version of the product. As a free product, SkyOrb 3D really shoots for the stars with what it wants to offer, but in my opinion it falls short of where it needs to be. While its command of visuals is hard to beat, I found SkyORB's controls less appealing. As a demonstration of the company's 3D engine, it succeeds, but as a star chart it's a curiosity at best.